We’re not asking that you take lots on, just that you do your bit to make sure that the club runs well. Do DECK DUTY. Every training session must have a parent in attendance, or “on deck”, as it is called. Training sessions can not be held without an adult being present. This is a requirement of Swim Ireland for the protection of both members and the coaches. You will be on the rota once or twice a term, usually on days that are suitable for you – the rota is available on this site. It is a great opportunity for you to meet the coaches, other parents and witness the effort that members put into a training session. Sign the roster and ensure the coach also signs. Be on THE COMMITTEE. Now this is not as demanding as you may think. The committee meets each month to discuss matters about the club. As these meetings are held regularly they are kept fairly short and to the point. An AGM is held each year in May and people can opt for a particular role or be a general committee member. New ideas, views and opinions are always welcome. Go FUNDRAISING. Like all clubs we need funds to survive and the fees do not cover all of our costs. To make up the difference we usually held a Bag-Pack Day and a Church Gate Collection. In March all the swimmers will be raisimg funds in a Swimathon. You will be needed to encourage your child to collect sponsorship and to help out on the day. The more we funds we raise the more financially secure the club is. Attend GALAS. Come and support your child and the club at home and away events. 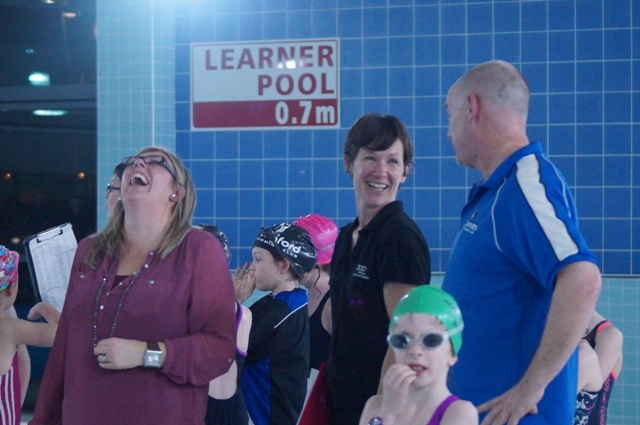 When galas are held in Longford pool parents are asked to provide break-time sandwiches and cakes for the visiting officials. All contributions greatly accepted! We also need people to help set up the timing equipment before and after a gala – this takes about an hour. You can play a more active part in a gala by becoming a timekeeper, a lane judge or a race organiser – it’s not as tricky as it sounds and training is given beforehand. Your active support and enthusiasm ensures that our club thrives.